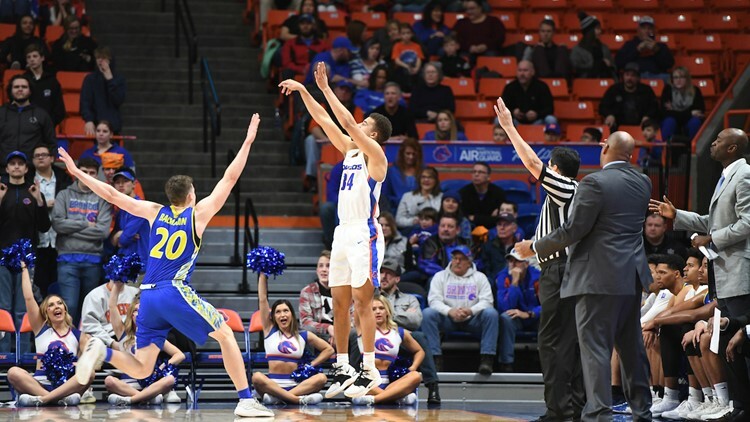 Boise State's Alex Hobbs shoots a three-pointer against San Jose State on Saturday, February 9, 2019, at Taco Bell Arena in Boise, ID. Hobbs scored 17 points in the Broncos' 105-57 win. The Broncos are 6-5 in Mountain West play and are at a crossroads tonight as the conference schedule ratchets up a notch. Is there any afterglow from the 105-point day against San Jose State? BOISE, Idaho — Wednesday, February 13, 2019. On his way to establishing the college basketball records for points in a season and a career, Furman sharpshooter Frank Selvy sinks 41 field goals and 18 free throws to score 100 points in a 149-95 shellacking of Newberry, shattering the NCAA single-game record of 73. Rio Grande's Clarence "Bevo" Francis would score 113 against Hillsdale College the same season. Those were the top two totals in history until Grinnell College’s Jack Taylor poured in an unimaginable 138 points against Faith Baptist Bible in November, 2012.